If you really want to release stress, you should know there are principles at work behind healthy body - healthy mind that reach far deeper than the vitality you get from cycling, running trails or even doing most modern versions of yoga. In total there are 3 principles of energy that govern the physical, emotional, spiritual domains of your being and your brain, and the laws of the universe that inform your nature and physiology. Using them will improve your health, strengthen your character and open your true potential, which is what we all long for. It's like returning to the warm hearth on a winter's day... opening a little gift, discovering that gift is you and drawing out endless treasures that awaken your sense of curiosity, innocence and purpose with a joy that has no end. The 1st of three principles, “Water Up - Fire Down,” is also referred to as the microcosmic circuit. It manages the parasympathetic response of the autonomic nervous system, emphasizes physical health and offers us an important balancing perspective. 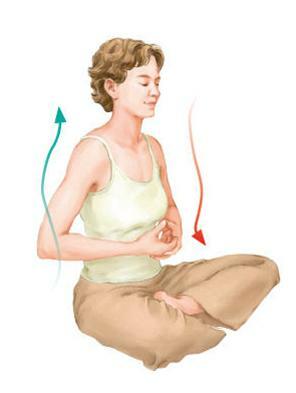 According to this principle, warm fire energy, produced in your heart, should travel down to your abdomen. Cool water energy, produced in your kidneys should travel upward through an energy channel along your spine. Good health is characterized by a warm belly, which is good for your abdominal organs, and a cool head, equated with a clear mind. Negative health consequences come with reversed energy circulation. When the energy center in your lower abdomen is weak, it’s hard to hold fire energy in your abdomen. Poor stress management constricts the chest and forces fire energy back up toward the head. Symptoms of this reversed energy flow include a warm head, a cloudy mind, headaches, irregular digestion, anxious thoughts, shoulder tension, lower back and joint pain… and is the primary instigator underlying lethargy, depression and disease. As water up-fire down restores the physical energy builds in the dahn jon (lower abdomen-2nd chakra), healthy energy circulation restores in the digestive system. The body’s blood supply is purified and nutritional absorption is optimized. Clear, fresh energy and blood circulates through the entire body. Water Up- Fire Down energy condition begins on the physical level with your basic health and immune system, by deepening your breath to warm your intestines. Since most people in our current information age have too much heat or fire energy in their head, there is often stiffness or blockage in the neck and shoulders or chest that needs to open and clear or stiff, cold intestines that need to warm and relax and release toxins first. Then you can build ki-energy with purified blood and efficiently drawn nutrients. It's usually best to start warming and toning with Belly Drumming followed up with Intestine Exercises for more focused cultivation, making space in your lower Dan Jon for Ki-energy to concentrate, cultivate and grow into your core power. Toe tapping is also a great way to draw energy down and restore circulation using principles of stimulation, resonance and reflexology although it won't build power in your core. Intermediate and advanced practitioners build on the foundation of Water Up - Fire Down from physical health, to energy management (emotional Intelligence) into self-mastery. They incorporate the 3 Principles it into daily life and cultivate their character along with their qi-energy through Qigong, Dynamic Meditations,The Tao Healing Arts & Martial Arts. For a perfect opportunity to create new habits through a 3 part masterclass. It's complimentary, I'm inviting you as my guest. It's a unique masterclass where I will guide you through practices and principles step by step to develop your own success habits.